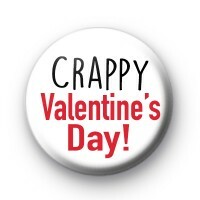 This is a white 1 inch pin badge with words Crappy Valentines Day in black and red. Are you fed up of Valentines Day and don't want to take part in all that lovey-dovey crap, then this could be the perfect badge for you. It would also be fun to give to a friend that is also sworn off romance this year, poke fun at love and bring a smile to their face. Make sure you take a look at our other Anti-Valentines Day badges, we have quite a few in stock.